I love adding cheese cubes , crumbled cheese , grated cheese to my salad. The day hubby sees cheese in the salad, he comments ” someone’s favourite is on the menu again!” Not that he wouldn’t eat the cheese, am sure he too loves it. 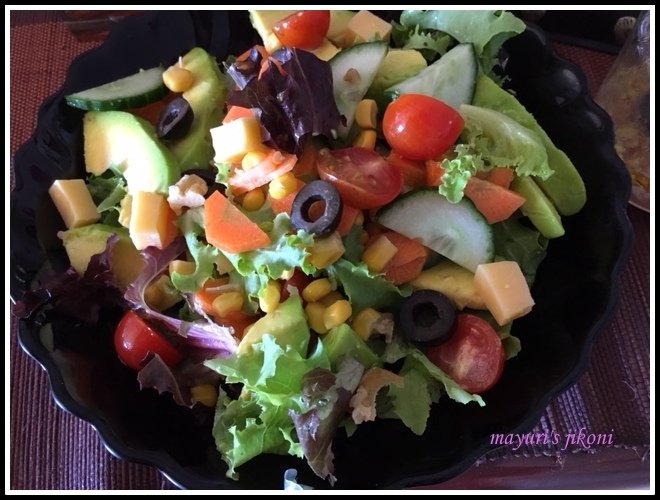 Cheese makes the salad more fun…. can you imagine the mixture of different tastes…. its like music for the tongue. Enjoy this simple and lovely salad. Yes, avocados are still in season and not joking at all but now they are huge, they are actually the size of a hawaiian paw paw. I am serious. Make the dressing first by mixing all the ingredients. Let the onion marinate in the dressing for 20 to 30 minutes. To prepare the salad, wash and dry the lettuce leaves. Tear into big pieces. Put it in a big bowl. Peel and cut the avocado into chunks. Add a dash of lemon juice so it does not turn dark. Add to the bowl. Add the cucumber slices, walnuts, sweet corn, cheese and olives. Peel the carrot. Grate it into slices lengthwise or round slices on a mandolin or with a peeler. Then cut the slices into half. Or cut into sticks. Add to the bowl. Cut the tomato in chunks or if you are using the small ones, cut into half or leave them whole. Mix the salad and add the dressing. Add salad leaves of your choice. Add pineapple chunks, cranberries or blueberries.